Protein pancakes have been my go to breakfast for years now, and although I go through phases of having them daily then not having them for a month or so at a time, I still love them all the same. Cellucor is my favorite protein powder, our cabinets are full of their products. Cinnamon Swirl is my all time favorite, but then I got my hands on the Red Velvet Cake Batter...it's life changing you guys. 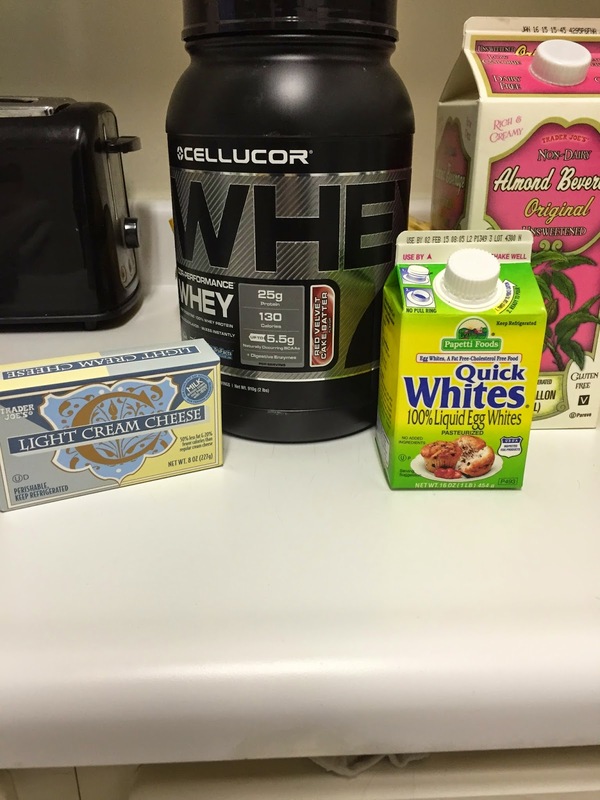 For this recipe all you need is RV protein powder, 1/3 cup of egg whites and 1 cup of almond milk. I topped my pancakes with a little bit of light cream cheese, which really made it feel like I was eating cake for breakfast. I put all of my ingredients, except the cream cheese into my Nutribullet and blended until the batter was smooth. I find it's easier to cook the pancakes when they're all the same size and have the same consistency. These are definitely going to become part of my procake rotation. I am also going to try and make protein cookies or cupcakes for Christmas using this flavor. love me some protein pancakes, these look yum! Yummm! My all time favorite breakfast is cheesy scrambled eggs. Hi Carlyn, You had me at red velvet, which is my favorite dessert. I eat overnight oats for breakfast most days, but have been known to cook a protein pancake here and there. Thanks for sharing!